Virginia taxpayers' share of legal bills for Gov. 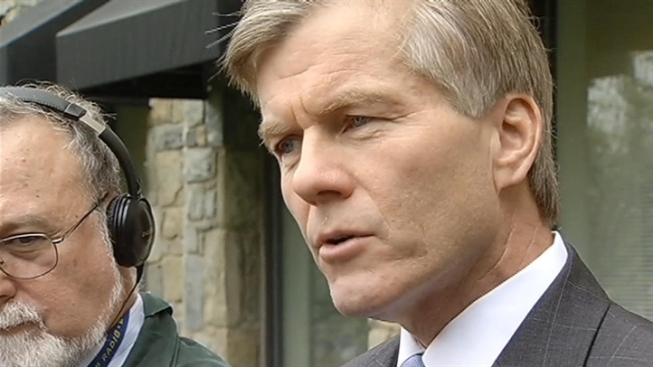 Bob McDonnell's representation in a case involving theft charges against the former chef at Virginia's Executive Mansion and other allegations grew by $90,036 in June. The June bills represent a total of 396 hours worked by former state Attorney General Anthony Troy of the Eckert Seamans law firm and 12 other lawyers. They bring the total to $143,566, counting the firm's previous bill for $53,530. Attorney General Ken Cuccinelli appointed Troy, a Democrat, to represent the Republican governor in an official capacity as warranted by a criminal case against former chef Todd Schneider and "other related matters.'' Troy took on the case in April. Cuccinelli is the Republican nominee for governor. A report that Troy issued in June concluded McDonnell broke no law by not disclosing thousands of dollars in gifts and loans to the governor and his family from Jonnie R. Williams, the chief executive of Virginia-based Star Scientific. Federal and state criminal investigators are looking into whether Williams or his company benefited as a result of more than $124,000 worth of gifts and loans to the first family. The governor defended not reporting the gifts, noting that Virginia's public ethics laws require the disclosure only of gifts given directly to public officials, not their family members. In July, however, he publicly apologized for his actions and those of his family and announced that the gifts and loans are being returned or repaid to Williams. McDonnell and First Lady Maureen McDonnell have not been charged. They have privately retained separate attorneys to represent them personally in that investigation, and friends have established a defense fund to help the McDonnells pay their mounting private attorneys' fees. Schneider faces four felony counts of embezzlement alleging he took items from the mansion's kitchen during his two-year tenure there starting in 2010. Schneider, in documents that his defense team filed in Richmond Circuit Court, alleges that he was told to take the items as cashless compensation for private services for the McDonnell family. He alleges that family members also helped themselves to kitchen items for private and personal use. Cuccinelli's office had been prosecuting the embezzlement case against Schneider. In May, Cuccinelli persuaded a Richmond judge to recuse his office from the case, arguing that it could force him to interrogate in court state officials whom his office is obliged to defend. Greg Underwood, Norfolk's commonwealth's attorney, was appointed to replace Cuccinelli's office in prosecuting Schneider. Cuccinelli, however, also accepted more than $18,000 worth of gifts from Williams and Star Scientific, and once owned more than $10,000 in company stock. Some of the gratuities, including a $3,000 summer family vacation and a catered $1,500 Thanksgiving dinner at Williams' palatial waterside getaway at Smith Mountain Lake near the Blue Ridge Mountains, were not disclosed until April, when Cuccinelli amended four years' of economic disclosure forms to include items he said he had earlier forgotten. In July, Richmond's Democratic commonwealth's attorney, Mike Herring, said in a report that Cuccinelli broke no state law with his tardy disclosures of Williams' gifts. More bills are on the way. The two August 27 invoices from the law firm do not include work done in July or August. Rates by a total of 14 attorneys and other professionals in the June billing range from $110 per hour to $250 per hour for Troy and five other senior attorneys on the team. The average rate for 622 hours reflected in all bills received so far from the state-paid legal team comes to slightly more than $230 an hour, a modest rate for attorneys from high-powered national firms.